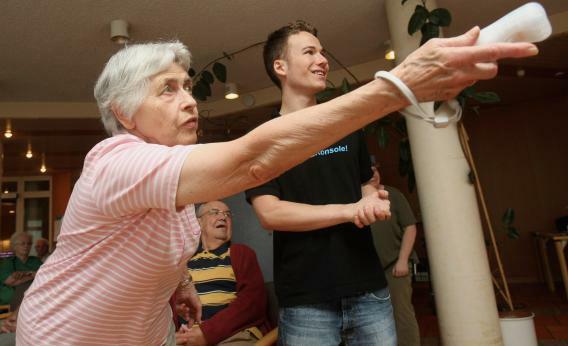 Research shows surprising number of senior citizens play video games. We young’uns tend to dismiss everyone older than 65 as hopelessly out of touch with technology. As an extension of that, most of us would find idea of the elderly joining dwarf guilds or besting us in motion-detecting games like the Wii or Xbox Kinect is downright laughable. (Feel free sound off against my reckless ageism in the comments, but my grandmother has never driven a car, let alone blown one up on Grand Theft Auto.) However, new research suggests not only that the elderly are playing digital games in surprising numbers, but that doing so may be an indicator of emotional health. In a study to be published in the July edition of Computers in Human Behavior and available now online, researchers recruited elderly adults—with average age of 77—from senior centers, religious centers, and senior living apartments. As part of an effort to test cognitive training via games, the participants were first asked to rank their usage of digital games. The survey revealed almost a third of the seniors played at least once a week. Just over 17 percent played every day. Games reported included everything from computer solitaire and free cell to puzzle games (crosswords, Sudoku) and Wii Bowling. The seniors also took part in a battery of perceptual, cognitive, and affective tests. These included the widely used CES-D scale for depressive symptomatology. Interestingly, the researchers found regular and occasional gamers to have significantly lower mean levels of negative affect. Additionally, gaming grandparents reported significantly better instrumental/everyday functioning than non-gamers. If nothing else, Allaire hopes these initial results might highlight the potential benefits of gaming for an older population—even if it’s less intense than the cognitive acumen required to stay alive while playing Call of Duty, which Allaire admitted to doing just before (during?) our phone interview. Now, before your brain explodes with correlation/causation critique, know that the researchers preliminary analysis is grounded in boilerplate scientific conservatism: “It is possible that these difference are not a result of playing digital games but represent preexisting differences with lead to the adoption or avoidance of playing digital games.” However, the authors are optimistic that further interventional gaming studies will yield emotional and psychological benefits as they have increasingly done with cognition. This study fits into a growing literature of research to assess just how good or bad video games are for us. One thing’s certain, we’re bound to keep learning more as 10,000 Baby Boomers march into senior citizenship every day—fewer and fewer of them noobs.